Together with the adjoining Bandipur National Park, Mudumalai National Park and Wayanad Wildlife Sanctuary,it forms the largest protected area in Southern India, totalling 2,183 km2 (843 sq mi). The important predators and carnivores in Nagarhole National Park are the Bengal tiger, Indian leopard, Ussuri dhole, sloth bear and the striped hyena. The herbivores are chital, sambar deer, barking deer, four-horned antelope, gaur, wild boar and Indian elephant.. Other mammals includes the gray langur, bonnet macaque, jungle cat, slender loris), leopard cat,, mongoose, European otter, Indian giant flying squirrel, Indian giant squirrel, porcupine, golden jackal, chevrotain, hare and pangolin. Over 250 species of birds are found at Nagarhole National Park. Besides the enormous variety of woodland birds, there are large congregations of waterfowl in the Kabini river. Birds range from blue-bearded bee-eater, scarlet minivet and Malabar whistling thrush to the more common ospreys, herons and ducks. The main trees found here are rosewood, teak, sandalwood and silver oak, crocodile bark, Lagerstroemia lanceolata, Indian kino tree, Grewia tilaefolia, rosewood and axlewood. In the winter the area can be very dry so the foliage on the trees is limited and dry. 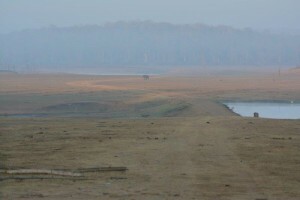 The reservoir, in the dry season, is not full so the banks provide important grassland for the herbivores. When the rains come the whole park springs to life with green foliage throughout.